Why Use Ice Breaker Games At Your Baby Shower? They create a positive fun atmosphere. Help people to get acquainted with each other. Keeps guests occupied while waiting on others to arrive. If you have a large guest list, choose ice breakers that will encourage your guests to mix and mingle. This will motivate them to step outside their comfort zone and socialize with people outside their circle of friends. 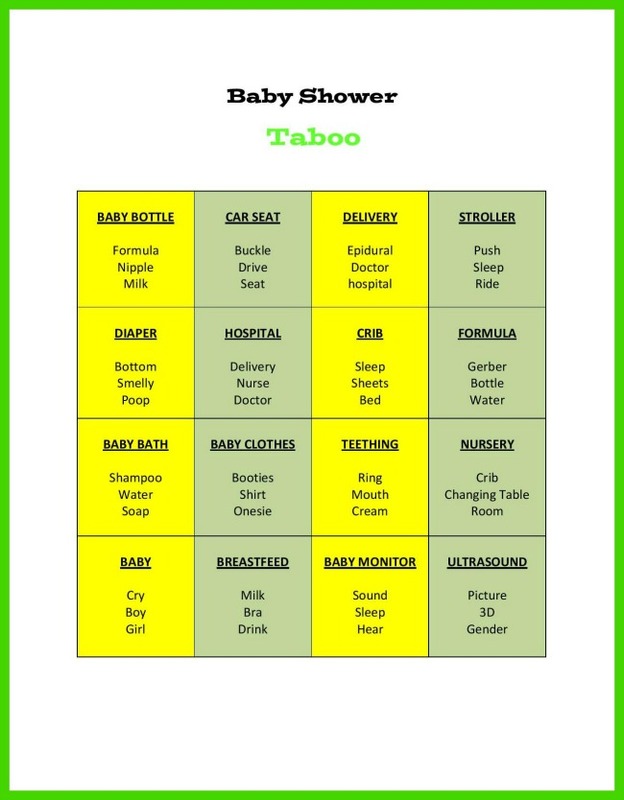 Baby Shower Taboo is a great ice breaker since its perfect for a large group and can be played individually as well. Take some preparation before but if you are looking to pump up the excitement level a few decibel then this one is a must play. There is nothing like a little fun wager to break the ice and spur on some friendly competition among guests. 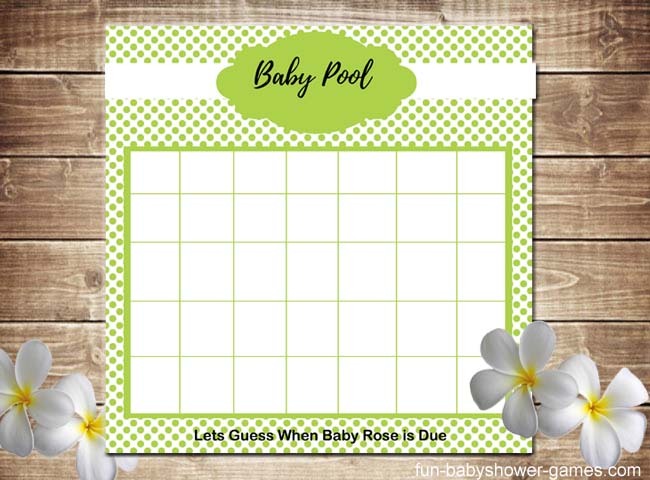 Play the baby shower pool game to see which lucky guest will get the baby's birthday correct. Its the perfect opportunity to get people talking while waiting on others to arrive. 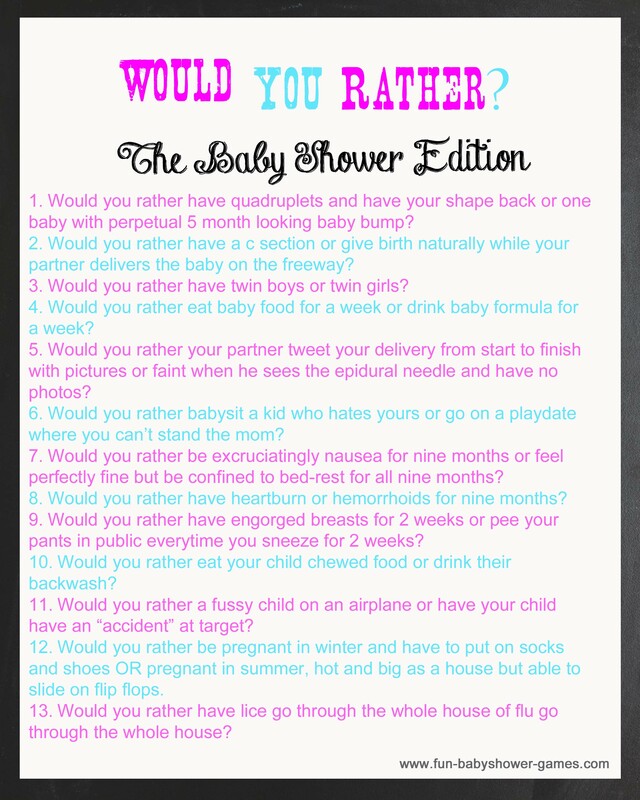 Would you rather baby shower game a hilarious ice breaker to really get everyone talking! We heard about this game on a blog and really just had to spread the word. Click the link about to download the game and its FREE!! A sure way to get people talking and moving around the room. Who Am I? 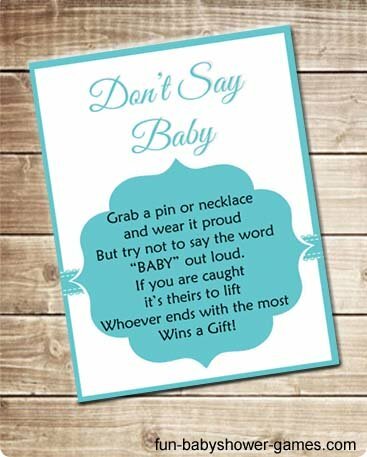 Ice Breaker- Prepare a card for each of your guests and write on it a baby item such as "dirty diaper". On entering pin a card on the back of each of your guests, who then must go around the room asking questions of each other to find out their identity. When they guess correctly the card is then pinned on their front for the remainder of the shower. That will be their name for the remainder of the shower. Who Dun It?- This is a popular ice breaker game that gives people a chance to go around and get to know each other. Provide guests with a list of phrases such as "has a twin or Was a cheerleader". 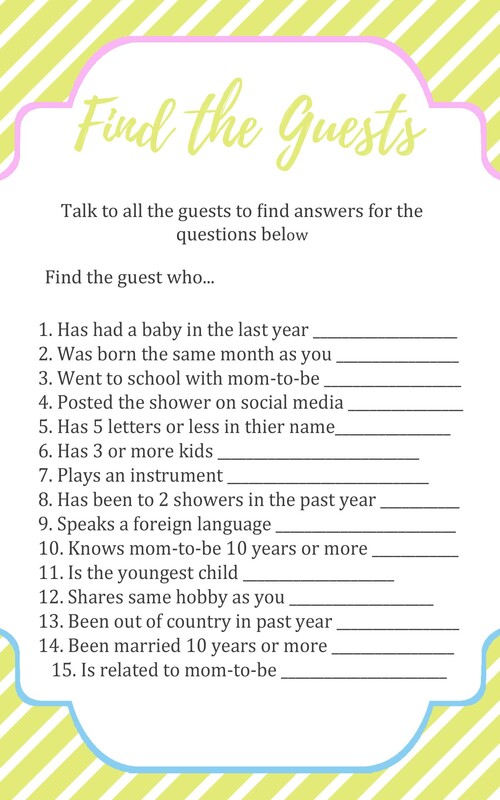 Guests then are asked to go around and talk to each other to see who fits the phrase by writing in their names beside the phrase.The person who has the most names at the end of the shower is the winner. You Said Baby Ice Breaker Game- This ice breaker is a variation to the don't say baby game. Provide guests with small items such as ribbons or clothespins when they arrive. Whenever someone says "baby" they then have to hand over their item to the person who heard them. The person with the most items at the end of the shower wins a prize. This is a lot of fun because guests have the opportunity for getting back into the game easily. Nursery Rhyme Line- Write down a line or two from a nursery rhyme and give it to guests when they arrive. When all the guests arrive tell them to find the other half of their rhyme by approaching someone and saying their rhyme aloud to them. That person in turn will say their rhyme. The two guests that finishes their rhyme first wins. 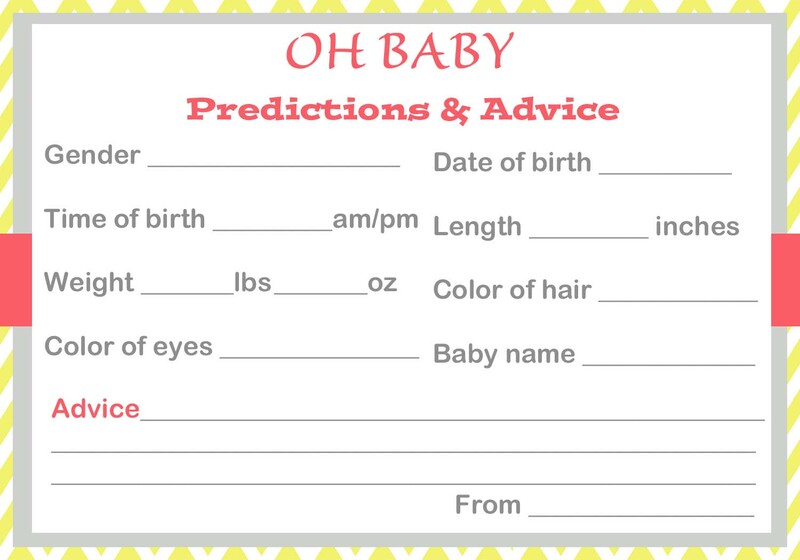 Baby Name Tag Ice Breaker Game- Give persons name tags with a question on one side and the answer on the other side, persons should memorize the question and answer. Pin the side with the question showing on their clothes. Persons will read your question, if they give the correct answer then they win a prize. An example of a question could be What do babies wear?" with a possible answer being diaper. But wait this ice breaker game is not over yet! Let quests know the answer on their tag is their new name through out the rest of the shower. If a guest forgets and calls anyone by anything other than the name on the name tag then they have to donate a dollar towards the baby diaper fund. M&M 20 Questions- Pass around a bag of M&Ms. Let each person take as much as they want. Tell them not to eat them...not yet anyways. When everyone has some M&Ms break them up into pairs or small groups. Hand them each a paper which contains one word for each M&M color. Let them ask a question for each color M&M they have in their hand. The trick is if they have five red M&Ms then they have to ask five different questions which contains that word. For each question they get answered they get to eat a M&M. The group that finishes all their M&Ms wins a prize. My Name Is- Have each guest introduce themselves. The trick is that their names have to rhyme with something, for eg Billy could be "silly Billy". Another way to play this game is to have them introduce themselves by adding an adjective that begins with the letter of their name to their names, eg nerdy Ned. Shower Line Up Game- This is a classic ice breaker you can adopt for your shower. Break up guests into small groups and give them a list of tasks to complete. Have the group form a line in order of questions given. The group that finishes first wins and gets a prize. Another fun line up game is the Nursery Rhyme line Up Game. Print out two or three nursery rhymes depending on how many guests you have at your shower. Cut out line by line of each nursery rhyme and then put them all in a container or hat. After all guests have arrived tell them to each take a line from the hat. Have them try to find the person who has the next line to their nursery rhyme until everyone is lined up and their rhyme is complete. The team that is lined up in order of their rhyme is the big winner.